Amesbury, Wiltshire | As the 2013 excavation season of this intriguing wetland site near Stonehenge continues, significant dietary evidence seems—according to press excitement—to include amphibians. But then the media hype this last week, suggesting the “English” ate frogs legs (or toads) before the French, needs some perspective, not least because we were still joined to continental Europe at the time! A partly charred leg bone in a fire hardly constitutes a “come dine with/on me” gastronomic venture? There are many reasons as to how such bones (or a single bone) could have arrived there—and unfortunately we have no human faeces (number twos) to examine. So for me this remains an intriguing but unprovable (if not terribly surprising) possibility—perhaps a leap of faith a little too far for now. Now, anyone want crabapple chutney on their hedgehog burger? How’s your stoat kebab, Poika? Bletchingley, Surrey | 2005-06 excavation of extensive flint scatters, pits, hearths and activity areas. 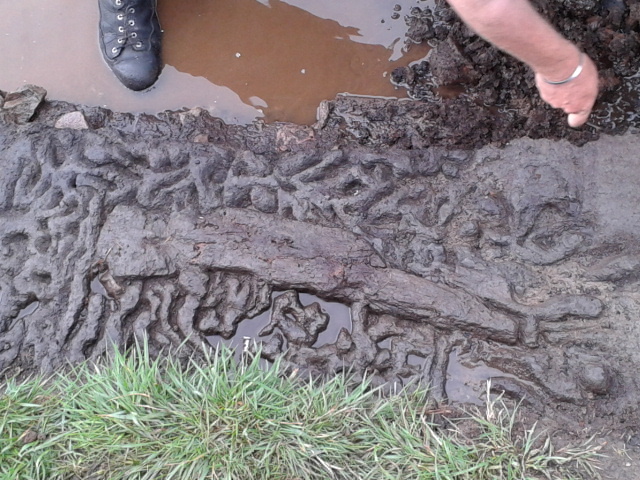 Bradford Kaims, Northumberland | Ongoing excavations of an exciting wetland site with Neolithic burnt mounds, Late Mesolithic-into-Neolithic lithics and, this season, a wooden “paddle” that seems to date to the Mesolithic-Neolithic transition and may have been used for moving hot stones versus boating. Bradford Kaims is part of the crowd-funded Bamburgh Research Project. This entry was posted in British archaeology, Digs, Hunter-gatherer-fisher, Mesolithic, Microburin miscellaneous, Sites and finds and tagged Amesbury, Bletchingley, Mesolithic, Neolithic, Northumberland, Surrey by Spencer Carter. Bookmark the permalink.